Paul Gabb '06, MA '17, operations and business manager at Turkey Knob Apple Growers in Timberville, Virginia, participates in a class discussion in spring 2017. While the bottom line is indeed important to Paul Gabb, he is drawn more to the people who contribute to a business’s success. Now, thanks to Eastern Mennonite University’s MA in Organizational Leadership (MAOL) program, Gabb says he’s deepened and broadened the leadership skills of his nearly 30 years in the business world. Based in several hundred acres of Shenandoah Valley orchards, the business sells its apples throughout the United States and internationally through wholesalers, distributors and retail chains. They also grow peaches, nectarines and cherries for seasonal sales at two area farm stands, local farmers’ markets and local retailers. Through MAOL coursework, Gabb says his leadership skills have expanded to better awareness of his strengths and weaknesses, stronger listening skills, the capability to view multiple perspectives, and a versatile and more flexible leadership style. “I highly recommend the program to anyone who thinks they are a leader or need to become a leader,” said Gabb, who also completed his bachelor’s degree in 2006 through EMU’s Adult Degree Completion Program. 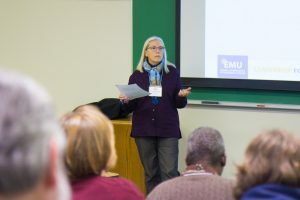 The MAOL program is just one of several graduate and certificate programs at EMU with the common curricular goal of developing leadership for the common good. Additionally, the highly successful degree completion program, which started in 1995, has a similar emphasis; students with at least 60 credit hours of undergraduate work can work towards a bachelor’s degree in leadership and organizational management. Roxy Allen Kioko teaches in the MA in Organizational Leadership program. Students bring their skills, life and professional experiences into the classroom, where they explore leadership and organizational skills, as well as conflict management, strategic planning, decision-making processes and financial management. The MA in Organizational Leadership program graduated its second cohort in April and will enroll its fourth cohort this fall. Professors Carolyn Stauffer and Roxy Allen Kioko have been added to the faculty. Stauffer, who teaches in the undergraduate Applied Social Sciences Department and with the MA in Biomedicine program, will teach an introductory course in leadership studies. Kioko, who is completing her doctorate at James Madison University, will teach project development. A cross-cultural component has also been added. 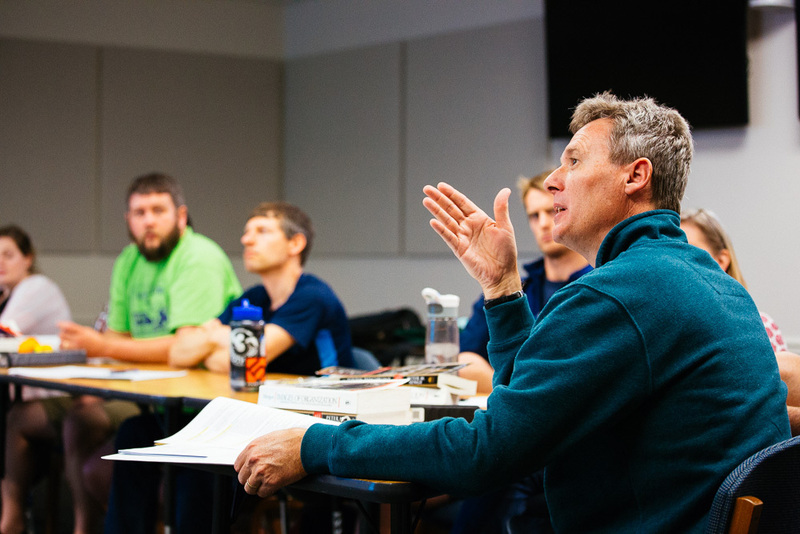 “EMU has long led the way in promoting the benefits of a cross-cultural learning experience and we want our graduate students to have this opportunity as well,” says Professor David Brubaker, the new director of the MAOL program. Dr. David Brubaker leads the MAOL and MBA programs at Eastern Mennonite University. MAOL students beginning this fall will have two options at the end of their coursework: an organizational sustainability course that includes travel to Costa Rica (a requirement of the MBA for several years), or a domestic cross-cultural course designed with 2-3 weekend excursions to areas of cultural diversity in the Mid-Atlantic region. Brubaker has added oversight of the MAOL program to a portfolio that also includes administration of the MBA program. He has taught in the MAOL and MBA programs, and for many years, taught in the Center for Justice and Peacebuilding. He takes over from Dr. Sue Cockley, who will become interim graduate dean. 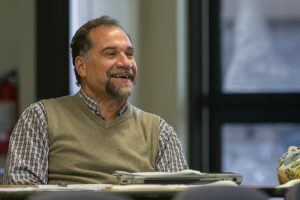 “Dave brings significant real-world experience to his teaching and administration, gleaned from many years as an organizational change consultant,” Cockley says. Dr. Ann Hershberger brings decades of experience in public health and NGO management to the Humanitarian Action Leadership program. This summer and fall, local and international students alike will benefit from a series of online courses offered by EMU’s Humanitarian Action Leadership (HAL) program. “The HAL program is a response to the growing challenges and complexities of our global society, offering a range of courses delivered by experienced practitioners to NGOs, aid agencies, government organizations, businesses, and individuals working to address natural and human-made disasters,” says Dr. Ann Hershberger, who came to teaching from a multifaceted career in family and community health, including many years in Central America. Coursework draws on EMU’s niche programs: sustainable and compassionate leadership, peacemaking and peacebuilding, and trauma awareness and resilience. The program explores topics related to disaster response and humanitarian action through the lenses of climate change, peacebuilding, justice, sustainable development, capacity building, resiliency and personal formation from a values and faith base. These courses are available in multiple formats. Students can choose to pursue a graduate certificate (18 credits), a MA in Interdisciplinary Studies (36 credits), or an undergraduate minor. HAL will also work with individual organizations to develop and deliver custom training sessions or workshops to address specific needs. Dr. Don Tyson leads a class of students in the MS in Nursing program. The Master of Science in Nursing (MSN) program started its eighth year of operation with an orientation session in May 2017 for the Leadership and School Nursing concentration and with the upcoming orientation in July for the Leadership and Management concentration. “Students and faculty continue to explore new ways to integrate the EMU nursing philosophy of sacred covenant with servant leadership in the diverse practice roles and settings of nursing,” says program director Dr. Don Tyson. With students from Nepal to southern Africa, the MSN has increased in geographic, professional and organizational diversity. 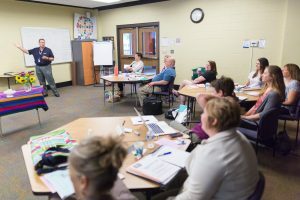 The program added adjunct faculty members Carli Youndt, MSN ’15, in the school nurse concentration, and Doug Alderfer, an assistant superintendent of schools with Rockingham County Public Schools, in the leadership and management track. enhancing nursing education through learning how to capture patient narratives. 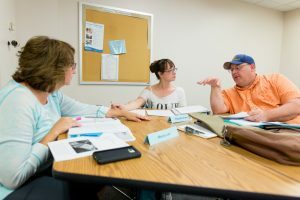 EMU’s Adult Degree Completion Program has a high rate of success, as students work in cohorts to complete a bachelor’s degree in leadership and organizational management. The newly revised Adult Degree Completion Program features the BS in Leadership and Organizational Management. The progam will begin offering hybrid classes for fall 2017, according to Margo McIntyre, program director. 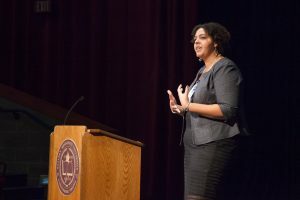 “This program is designed specifically for working adults who want to complete their bachelor’s degree while still maintaining work and family commitments,” she says. Students complete a 16-month program as a cohort, forming a learning community that provides academic and social support. A hybrid (or blended) format was chosen to address the need for flexibility without sacrificing a strong sense of community. Courses are offered in a five-week format with asynchronous (on your own time) online sessions during the second and fourth weeks of the course. During the first, third and fifth weeks, students attend a single traditional class session on campus from 6-10 p.m.